Rum has many common features with whisky. The raw material used in the process is certainly different, as rum is made from sugar cane, but the manufacturing process is a lot similar to whisky. For instance, old rums are aged in casks like whiskies. Famous independent whisky bottlers also own rum distilleries, as Murray Mac David who manufactures his rums using Islay water. Scottish stills are also used for rum distillation. Rum, in its numerous varieties, has many rich aromas and flavours to be discovered. To discover the palate of rum, 6 different groups of aromas may be distinguished: woody, toasty, spiced, herbaceous, floral and fruity. These main aromas may then be described through their various subtleties. 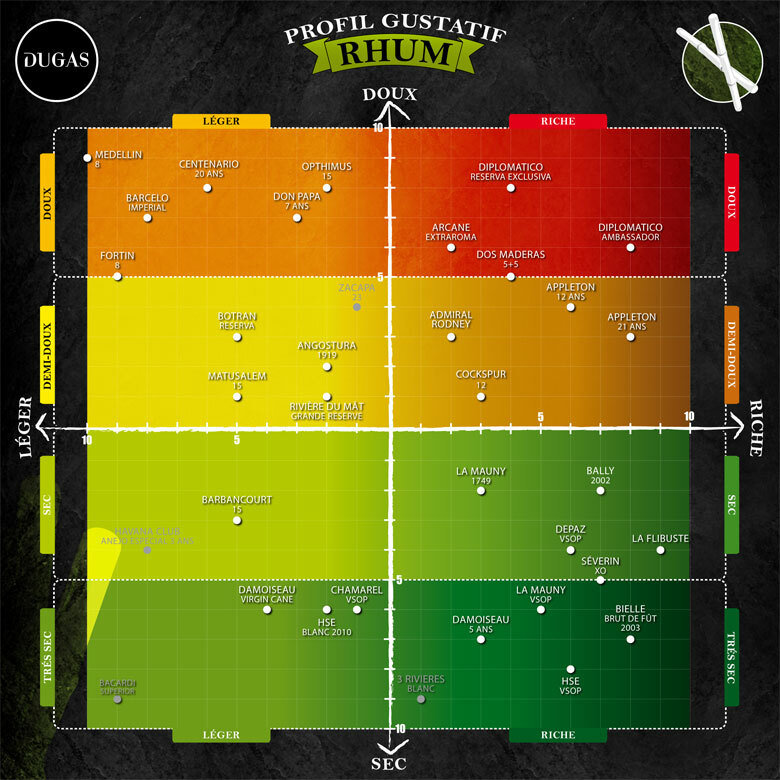 The Dugas House offers a classification of various rums based on several criteria. Compare spirits and discover the world of rums with this simple overview (Clockwise, starting from the top : Sweet, Rich, Dry, Light).